Bathrooms come in all shapes and sizes, while individual tastes and needs vary considerably when designing your dream bathroom. Our experts offer a range of high quality enclosures with different looks and finishes to match your style and budget. With a wide variety of sizes, glass options and hardware, your new bathroom awaits! Shower doors are now one of the most prominent features of bathroom design, with frameless enclosures becoming the most popular. Being highly versatile, this gives you the opportunity to create a custom style for your bathroom. Adding to an open lay-out by creating a feeling of space, this makes your shower feel larger and more luxurious, while accentuating other design elements including feature tiles and other bathroom fixtures. With a wide choice of finishes and hardware, a feeling of sophistication is achievable for any modern or traditional bathroom. Frameless shower doors are made of 10 mm tempered safety glass. Panels are made with precision, and are created to be strong and durable, long-lasting and used daily, meaning there is little to no maintenance involved. Glass is a non-porous surface that will not harbor mold, germs or bacteria, while lack of metal frames also mean there is no risk of rust or corrosion. Every company has their own installation methods for frameless showers. 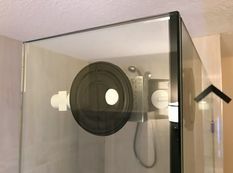 At Peak Glass our focus is giving our customers the most elegant and visually appealing showers possible. We do this by using minimal hardware, using clips only on vertical surfaces to prevent water penetrating water-proofing membranes, and uv glued corners for increased strength and aesthetics. UV glue is a thin liquid adhesive cured with UV light. It is used in place of clips and silicone due to its very high bonding strength, forming a joint so strong it's comparable to being welded together, while producing a clean, transparent look. Peak Glass has worked consistently to perfect our technique, which includes building our own essential tools and fixtures. Our aim is to keep glass to glass openings as tight as possible, since larger gaps allow water to escape. At Peak Glass we utilize techniques that control how water runs down the glass to the drain, without spilling onto the floor. 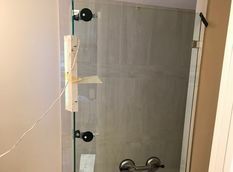 All these methods combined also save on the cost of hardware and glass fabrication, leaving you with an elegant, modern, high quality frameless shower. Simple in design, the basic steam shower consists of an enclosed tile room with a steam generator. Steam showers, or steam baths remain in wide use today due to the numerous health benefits they offer, and as a treatment for a range of physical ailments - from chest infections to joint pain. Steam is especially helpful for those who suffer from asthma, bronchitis and allergies, while also soothing tired and aching muscles. Unlike saunas, which surround an individual with coarse dry heat, steam showers provide a wet heat allowing comforting, warm, relaxing air that is gentle on the respiratory system and has the power to penetrate deep to relieve strain and stress. ​Don't underestimate the importance of upgrading your bathroom. This is one of the most frequently used rooms in your home and adds much to the resale value. The investment of a well planned, functional bathroom will add to the equity in your home and turn it into a true showcase. 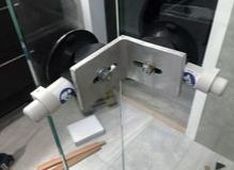 Glass shower enclosures are a safe bathroom asset as clear glass generally will not date. EnduroShield is an ultra-thin, non-stick, transparent glass treatment that reduces cleaning time by up to 90%. Untreated glass is porous, and as a result absorbs mineral deposits from water, shampoo, soaps, and harsh scrubbing using toxic cleaners. 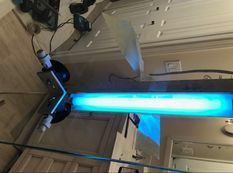 Over time this causes the glass to discolor and develop irremovable staining, while making it more difficult to clean. EnduroShield completely adheres to the glass to repel both water and oil based stains, with a simple application process of spraying the liquid coating onto a clean surface for a protective bond.